Contents of Part A. Introduction and Overview (C.W. Gehrke, K.C. Kuo). 1. Ribonucleoside analysis by reversed-phase high performance liquid chromatography (C.W. Gehrke, K.C. Kuo). 2. HPLC of transfer RNAs using ionic-hydrophobic mixed-mode and hydrophobic-interaction chromatography (R. Bischoff, L.W. McLaughlin). 3. Nucleic acid chromatographic isolation and sequence methods (G. Keith). 4. Affinity chromatography of mammalian tRNAs on immobilized elongation factor Tu from Thermus thermophilus (M. Sprinzl, K.-H. Derwenskus). 5. Structural elucidation of nucleosides in nucleic acids (C.W. Gehrke et al.). 6. Three dimensional dynamic structure of tRNAs by nuclear magnetic resonance spectroscopy (P.F. Agris, H. Sierzputowska-Gracz). 7. Codon recognition: evaluation of the effects of modified bases in the anticodon loop of tRNA using the temperature-jump relaxation method (H. Grosjean, C. Houssier). 8. High-performance liquid chromatography of Cap structures and nucleoside composition in mRNAs (K.C. Kuo et al.). 9. 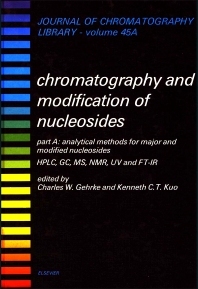 Immunoassays for modified nucleosides of ribonucleic acids (B.S. Vold). 10. Chromatography of synthetic and natural oligonucleotides (H. Eckstein, H. Schott). Subject Index.